I want to thank LEADS for helping the residents at our Washington Square Apartments in obtaining more insulation for their attics. This will be beneficial to all the residents as far as heating costs go and will also help keep them a little warmer. Once again, we want to thank LEADS for a job well done. The Home Weatherization Assistance Program (HWAP) provides home weatherproofing and energy efficiency services to qualifying individuals at no cost. Home weatherization can result in a savings of 30% or more on energy bills, providing much needed assistance to families that are struggling during these difficult economic times. 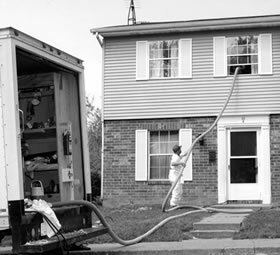 In addition, home weatherization reduces toxic emissions that are harming our environment. The Home Weatherization Assistance Program at LEADS received a substantial increase in funding as part of The American Recovery and Reinvestment Act of 2009. LEADS increased staff, and provided additional training to employees to teach customers how to save more energy. In addition to HWAP, Columbia Gas provides the WarmChoice program for its customers. Columbia Gas partners with LEADS to help income eligible customers with weatherization. WarmChoice reduces gas usage by an average of 28 percent. This can save customers approximately $400 in average savings. LEADS was named a regional training hub. Workers throughout central Ohio were trained in green energy related technologies for agencies. We use the HEAP / HWAP Application. Customers generally do not even know they are being recruited into these other programs until the inspector shows up and has them. The other program examples like this include, EPP, PASSPORT, etc. Internal guidelines used are 150% FPG, Columbia Gas of Ohio Customer, and PIP / HEAP eligible.